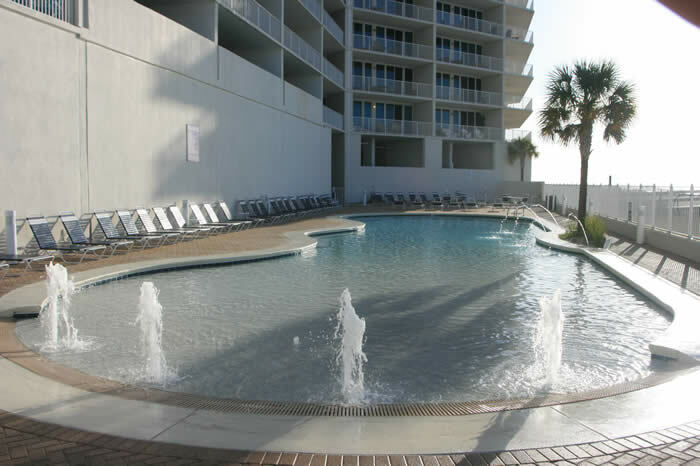 The Lighthouse Condominiums are in the largest beachfront development in the Gulf Shores condominium market. Within this highly popular complex, buyers will find two hundred and fifty-one spacious one, two, and three bedroom units, finished to high specifications. Owners of these stunning beach condos can enjoy an indoor, heated pool and two zero-entry outdoor pools, two hot tubs, three levels of covered parking, an exercise room with sauna, and a grill area. The interior features include whirlpool bathtubs, his-and-hers vanities, large walk-in closets, and fully-equipped gourmet kitchens. Keep reading to discover more about Lighthouse condominiums, or view current listings below for all Lighthouse condos for sale. The Lighthouse Condominiums offer luxury Gulf front living, conveniently located for access to a range of amenities including nearby Gulf State Park. The views of the park from the eighteen stories of The Lighthouse condos are lovely, and in just a short walk, owners can access all the camping, nature trails, kayaking, or fishing they could ask for. If nature isn’t your thing, then rest assured that The Lighthouse’s location in the heart of Gulf Shores, Alabama allows owners and their guests freedom to enjoy to every entertainment and fine dining option the city has to offer. Lighthouse Condos for sale in Gulf Shores provide the ideal year-round residence, vacation getaway, or investment opportunity. With its six hundred and thirty-five foot stretch of powder white sand and Gulf views, the Lighthouse is known for its high rental income potential. Guests return year after year to the Lighthouse Condominiums for the level of luxury amenities and high-end accommodations they are provided. Condos here are highly sought after because of this strong rental performance, so property in The Lighthouse community often does not stay on the market very long! For more information about Lighthouse Condos in Gulf Shores please contact The Gatti Team for professional real estate advice.